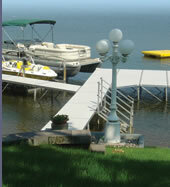 Shoreline Marine Contracting has been designing and installing wood docks for over 30 years. We know that each customer has specific needs and work to insure that the dock we design meets the standards of the client. In our wood shop we plane, sand and router each piece to fit the dock design of the customer. Once the wood is prepped and ready it goes to our staining room where two coats of stain are applied to each piece. We then fabricate the panels, side rails and ledgers needed for each dock and store them until it is time to install it.